The Jewish Museum in New York City is currently presenting the work of Chaim Soutine (1893-1943), featuring just over thirty paintings by one of the most distinctive and significant artists of the early twentieth century. 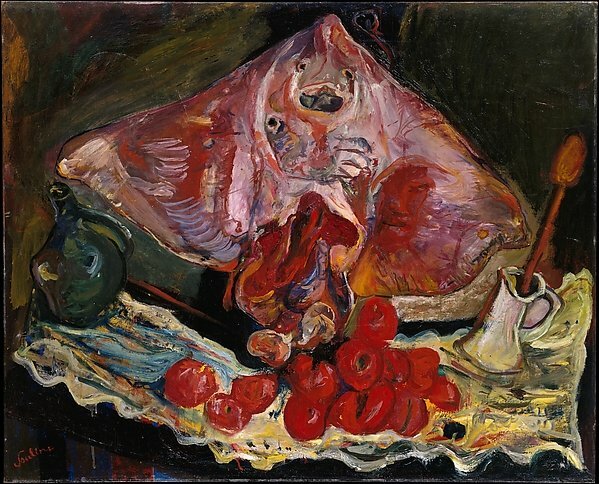 Focusing on still life paintings, of which he was a master, “Chaim Soutine: Flesh” includes his vigorous depictions of various slaughtered animals – of beef carcasses, hanging fowl, and game. These are dynamic works of great boldness and intensity, and taken together they constitute a sustained and profoundly sensuous interrogation of the flesh, of carnality – of blood, skin and sinew. The exhibition commences with Still Life with Rayfish (1924) – on loan from the Metropolitan Museum of Art – a painting which is characteristically Soutine: at once rather unsettling and at the same time utterly transfixing. The motif of the rayfish can be traced back to Jean-Baptiste-Siméon Chardin‘s masterpiece, The Ray (1728). 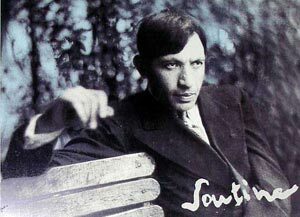 Soutine is often engaged with the old masters, whose works he discovered at the Louvre – but rather than copying or working directly from their paintings he would stage their subjects for himself within his studio, revealing an acute sensitivity towards the real fleshly being before him. The ray’s mouth is agape and seems to be locked in a silent yet ceaseless cry. The painting is an excellent introduction to this artist, who was virtually obsessed with the fundamental mystery of embodiment, and the way humans and animals echo one another. Not only dead creatures, but also even inanimate objects are quickened and enlivened by the touch of Soutine’s brush. Forks, for example, are subtly anthropomorphized: they become grasping hands, emaciated arms. Soutine himself was no stranger to hunger and he suffered from a severe gastro-intestinal condition that precluded him from eating the very meats he painted with such diligence. The carcasses of beef – of which Soutine painted at least ten – are among his most significant achievements. While he takes his initial inspiration from Rembrandt’s Flayed Ox (1655), which he would have encountered at the Louvre, Soutine does not simply copy the work of his predecessor. In fact, he famously hung actual beef carcasses from the rafters of his Monparnasse studio. Like Rembrandt’s Flayed Ox, Soutine’s beef carcass resembles the crucifixion of Christ. But Soutine would surpass even Rembrandt in his prolonged interrogation of the flesh as a kind of elemental being. Soutine would repeatedly pour blood onto the carcass to re-enliven the decomposing flesh and enhance its color. The powerful stench of rotting meat, as well as the leaking of blood through the studio floor led neighbors to complain (and in fact to suspect that someone had been murdered) – so much so that the police came to confiscate the putrefying carcass. The authorities were instead treated to a lengthy discussion on the high demands of Art. Soutine reminds us that painters of the highest order perform a kind of ontological function, an operation on behalf of being itself – a function that involves the turning back of the flesh of the world on itself. If Soutine’s work beckons us toward a compassion for animals, it is not by appealing to any rational moral principle; nor does it derive its authority from an extra-worldly source. Its origin is literally in the flesh, in the intercorporeity, the transitivity that exists between humans and animals – a connection and separation that is the presupposition and ground of carnal empathy.